SCE Image allows you to load and display one or several images, pictures, logos, etc. on your LEDs. And you can add certain animations to them. ▪ Playback Rate - Defines the speed of the Image Table and how fast images are changed. Valid values range from 0 to 50. ▪ Extrusion - Adds depth to the input; i.e. duplicates the input image [in % of the virtual LED matrix]. This is mainly relevant for 3D. The default value is 100. Valid values range from 0.01 to 100. Rotation - Rotates the image [0°, 90°, 180°, 270°]. The default value is 0. 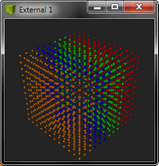 Tile - Tiles and duplicates the input and thereby generating patterns. Stretching / Aspect Ratio - Defines the aspect ratio of the image. The default value is Matrix. SCE Image allows you to load one image or multiple images at a time. Use the Image Table to manage multiple images as described below. ▪ Left Mouse Click - Selects an image in the Image Table. ▪ Double-Click Left Mouse Button - Immediately chooses and activates the selected image and displays it on the LEDs. In this way, you can define which image to show next. MADRIX will automatically continue in the list then, beginning with this image. ▪ Ctrl + Left Mouse Click - Allows you to select several images in the Image Table at different positions. ▪ Shift + Left Mouse Click - Allows you to select several images by selecting 1] the first image, 2] the last image, 3] and all images in-between will be selected automatically. ▪ Automatic Loop - When the last image of the Image List is shown, MADRIX will automatically loop back to the first image and start from the beginning again. Preview - Displays a small preview of the loaded or currently selected image. ▪ Shows the file name of the image. ▪ Defines how long an image is displayed [in s]. Select one or multiple images to adjust the value. ▪ Defines how long it takes to fade from one image to the next [in s]. Select one or multiple images and then adjust the value. Rotation - Rotates the image [0°, 90°, 180°, 270°]. The default value is 0°. New - Immediately removes all items from the list. Open - Loads a previously saved MADRIX Image Table from an external file [of the file type *.mitz or *.mitx]. Open And Attach - Loads a previously saved MADRIX Image Table from an external file [of the file type *.mitz or *.mitx] and adds the new images to the images that are already loaded. Save - Saves the Image Table to an external file [of the file type *.mitz or *.mitx]. 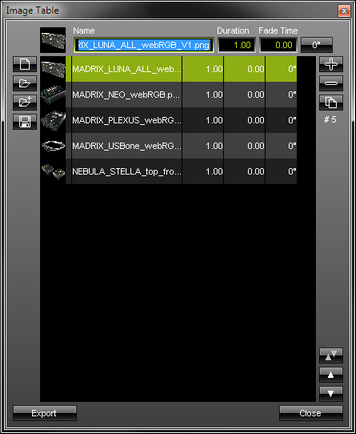 - The MADRIX Image Table File includes the images as well as the settings for Duration, Fade Time, and Rotation. Remove Images - Removes one or several images from the Image Table. First, select the images in the list. Duplicate Images - Copies the currently selected images and adds them as new items to the Image Table. Swap Position - Swaps the position of images in the Image Table when several images are selected first. Position Up - Changes the order, and positions currently selected images one step higher up in the list. Position Down - Changes the order, and positions currently selected images one step lower down in the list. Export - Exports the currently selected image or images from the Image Table as an external image file [of the file type *.bmp]. Close - Closes the Image Table window. ▪ Edit... - Opens the Image Table [in the same way you can open the window by clicking on Images with the left mouse button]. ▪ Open... - Loads images or a previously saved Image Table from an external file [of the file type *.mitz or *.mitx]. ▪ Copy - Copies the current images into the clipboard as a duplicate. ▪ Paste - Applies all images from the clipboard to the currently focused Image Table [Images]. ▪ Clear - Removes all images from the Image Table. Click with the left mouse button on the Images button and hold for 3 seconds. A small + appears. Now, continue to hold and drag the mouse to another image control [of a different layer] and release the mouse to instantly apply the images. ▪ File Drag And Drop - You can select a MADRIX Image Table file [of the file type *.mitz or *.mitx] in Windows and drag it to a color control of your choice in MADRIX in order to load it in MADRIX. 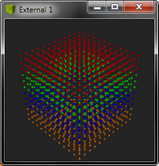 Example: Your virtual LED matrix is 10 x 8 x 4. Now, you have prepared an image and want to display it not only on the first Z-level or use Extrude, but on all 4 Z-levels. 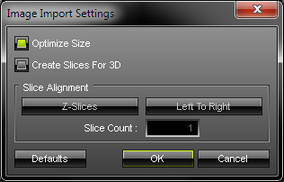 Then, you would let MADRIX create 4 slices. ▪ Slice Order - Defines how your source image is processed. 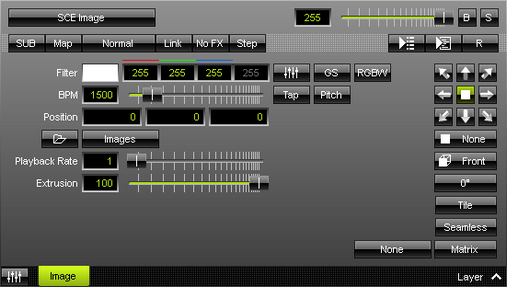 - Left To Right - MADRIX slices the image starting left. - Right To Left - MADRIX slices the image starting right. - Top To Bottom - MADRIX slices the image starting top. - Bottom To Top - MADRIX slices the image starting bottom. ▪ Please do use pictures with a pixel resolution according to the size of your LED matrix! ▪ It is not useful to use a resolution of 3000x2000 pixels if your LED matrix has a size of 192x128, for example. Please resize your pictures before using them in MADRIX. Please do also use 72 DPI. Both means will improve performance considerably. At the same time, you will avoid that the RAM of your computer will overload. ▪ Optimize Size - When activated, MADRIX automatically optimizes the file size of images loaded into MADRIX. 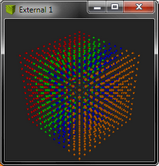 If the image has a larger pixel resolution than your virtual LED matrix in MADRIX, the software automatically reduces the pixel resolution of the image to fit the virtual LED matrix. Thereby the file size is reduced, which in turn reduces the required space in the local memory of your computer [RAM]. This increases performance and stability of the software and computer.